Before you leave home. Put £1 or €1 coins in pocket for Cyprus airport luggage trolleys. Weather: Check your 7 day forecast weather or on BBC etc. Time: Cyprus time is 2 hours ahead of UK time. What’s included at the villa? Before contacting us please look at the villa web page as this information is on the PDF. All villas have an iron and hairdryer, and include pool towels (1 pool towel pp). Electricity and plugs: The supply and sockets are same as UK: 240 volts, a.c. 50HZ. Be prepared for a power cut, they are common. If this happens please contact your owner. Check Euro rate here. This rate is usually higher than what is offered so use as a guide. There are various ways to pre buy your Euros and take advantage of a good rate. Generally speaking, your bank will not offer the best rate, and Airport kiosks often offer low rates. I find Money Saving Expert are excellent on all things relating to travel including their Travel cash link. You can have your money delivered to your home or collect at an airport kiosk, at a pre agreed rate, which includes the final price including any charges! Airports and travelling days are stressful. With airlines charging us per kg if our suitcases are too heavy, we need to really consider things when packing. Firstly, check the luggage allowance for your flight. I understand Thomson give the least hand luggage allowance, just 5kg. Many small hand luggage cases weigh almost 3kg. Most airlines allow 20kg for the main suitcase, but how many villas have scales to weigh the case on your return? With this in mind I am going to really TRY to keep to 15kg for my next holiday, so that coming home is more relaxing! You can usually use the scales of a closed check-in desk at the airport. Weigh your packed suitcase on bathroom scales before you leave home and leave some kg’s for the return, presents etc. Save beauty sachets and take these instead of bottles. Take almost finished toothpaste. Handy things to take: Antibacterial hand cleanser/wipes, Mosquito repellent, “Dry clean” grease stain remover spray, Plug in insect repellent/or buy there, 2 pin into 3 pin 240 volt (same as U.K.) travel adapter plugs, 98p on Amazon. More Expensive in Cyprus: sun creams, toiletries, pharmacy items. Wear cargo combat trousers and your heaviest clothes and pack socks, books etc. in the pockets of the trousers and jacket that you will wear onto plane. If you forget anything (I once left all my freshly laundered cotton blouses at home), Paphos has a number of Charity Shops where you can pick up items at a low price. This is what Helen Mirren does and she returns the items to another Charity shop at the end. Charity shops are also great for toys and games too, and you can leave them in the villa for the next children. Earplugs and drops. Prevent ear infections & pre buy floatable earplugs. Also “swim ear” drops sold on some flights now. Arriving at Paphos or Larnaca Airport: You are not met by us at the airport. Collect free maps and information from the Cyprus Tourist Office in the Luggage Carousel Hall at Paphos & Larnaca, open daily until 23.00. Arriving at the villa: You are not met at the villa. Take Villa Directions and Key instructions with you for your arrival, even if you are getting a taxi. Nissos and Stevie’s taxis do not have your villa number or (naturally) your key safe info. Water: All villas have drinking water in the kitchen via a separate small tap, just to the side or beneath main taps. Expect low pressure in your shower, this is normal. Hot water is from solar power, so if you want some left in the morning, use it carefully at night. Unlike UK, the hot water can take more than 2 MINUTES to run to warm/hot. Toilet paper. This must not be put in toilet, there is a small bin provided by the WC. In the case of the narrow pipes blocked with paper, plumbers will be chargeable to clients. Air Conditioning. All owners are bill conscious as Cyprus has the most expensive electricity in Europe. Air con is very expensive to run. It should be set at 25/26 degrees Celsius, too cold is bad for health. Ask Owner to check temperature & demonstrate remote controls when he visits. Please also turn lights/gadgets etc. off when not in use. 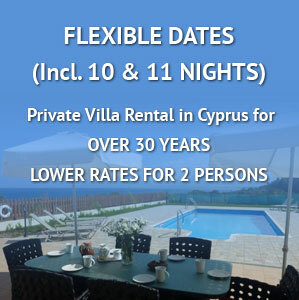 Many of our clients book a Bed & Breakfast or hotel for one night or two nights, and then they occupy the villa at the earliest time of 16.00 as they are there in Cyprus. Information regarding possibilities of where to stay when you have late return flights is below. Paphos area: Recently renovated Pafiana Heights on hilltop at Geroskipou, lovely views, fresh air, spacious and has a lovely huge pool. Also worth trying Kefalos Hotel-Apartments or the Corallia Hotel Apartments. Or Kissos Hotel. Described as staying at an “Uncle’s house” is the very basic but clean centrally located hotel Axiothea Hotel in the old town in Paphos. No pool. 2, Ivis Malioti Str., Tel 26932866 or 96395992. If you contact them please mention you are a Sundance Villas client. Polis area: There are some lovely small rural hotels near our villas in the Polis area, Lasa Heights see reviews and Paradisos Hills near our Villa Nicolas in Lysos, see reviews. Checking out needs to be by 10am prompt. All late checkout requests need to be made with owner when you are at villa. Coral Bay: Beachside, (great for children) use the facilities at Corallia Beach Hotel for the day, inclusive of shower, at a rate of Euro 10 per person. Take your own towels. They may have a room if you prefer this, and should supply towels, so please check. Tel. 00357 26622121. Fitos Inn at Geroskipou, (between Paphos airport and Paphos Town). Special rate for our clients: Euro 10.00 per person, with use of pool, shower and changing afterwards in changing rooms. If you prefer a room for some hours Fitos will charge the nett daily tour operator rate of Euro 50.00 for a double room. Normal rate to clients is Euro 60.00. +357 26 965666 mailto:s.kiki@cytanet.com.cy or mailto:sunbow@cytanet.com.cy Please quote Sundance Villas “Neoptolemos Michael” when booking to get these special rates. Or Tramps Café Bar can look after cases if you have a late flight. Please buy a drink there if they do this. They are in Tombs of Kings Road, Paphos. 26 946814 Ulysses, Michael and Nick will make you very welcome. If your late flight is Monday through to Saturday, then we recommend Costa’s Tavern, en route to Paphos airport, on the right of the B6 at KOLONI. You need to book and the meze is excellent, and if you have hours to kill, ask them to bring the food very slowly. Tel 26 961774 or mobile 99 175807. Currently open evenings only. Of course we recommend Tramps and Costa’s anyway, not just for late flight.